You can find the pole-zero plot by using PyLab and custom function splane(b,a) found at ssd.py. This function returns the system function numerator and denominator polynomial coefficients as ndarrays b and a. The plot is shown in the following figure. 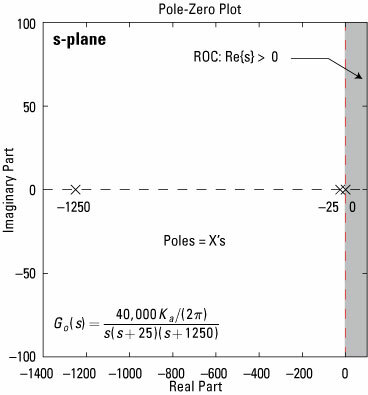 Poles exist at s = –1,250, –25, and 0 rad/s, making the open-loop system function third-order. A causal LTI system is stable only if the poles are in the left-half plane, so you may be wondering, “How can this system produce a stable output with a pole at s = 0?” The answer: You need feedback. Use PyLlab and the SciPy signal package function R,p,K = residue(b,a) to perform the partial fraction expansion. (Note: Residue is the continuous-time equivalent of residuez). Find the numerator and denominator polynomial coefficients by using the custom helper function position_CD found at ssd.py. The first exponential term decays to zero much faster (about two orders of magnitude) than the second. The poles also provide this information, because the system time constants are just one over the pole magnitudes, which are 1/25 = 0.8 ms and 1/1,250 = 40 ms for the first two terms. The analysis here shows that you can approximate G0(s) (a third-order system) with a second-order model. This helps, from a math complexity standpoint, for closed-loop analysis. The 0.8-ms time constant term (pole at 1,250 rad/s) in the open-loop model is insignificant, so it can be dropped next to the 40-ms time constant. The last line is the reduced-order model for the open-loop system function.